Boku no Hero Academia was supposedly one of the best anime of the season. I had heard many good things about it, I had even seen the fan manga of the current giants of shounen manga passing the torch to the protagonist. However, I had never actually read any Boku no Hero Academia and had not gotten around to watching the anime as of yet. 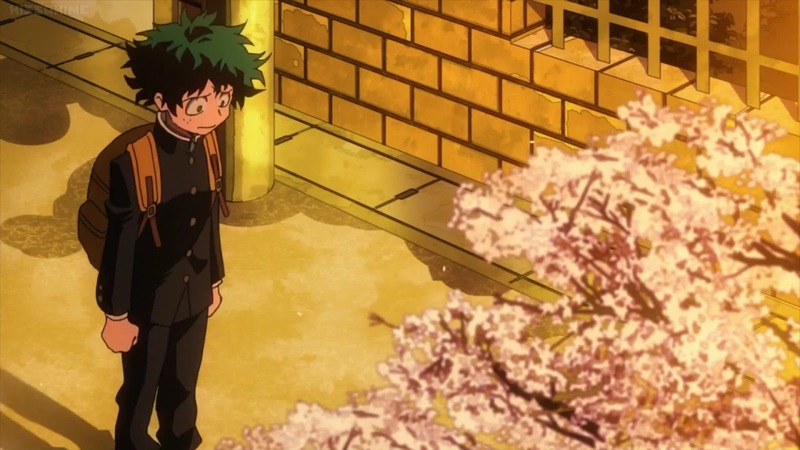 Finishing the anime about this 13 episode anime about Michidoriya, a boy who dreams to be a hero but does not have a quirk, I have quite a few things to say about it. To check out the action packed, hero-oriented review of Boku no Hero Academia, be sure to click the jump and check it all out! The world that the protagonist lives in happens to be one where everyone has a unique power called a “quirk”. These are rather common now, and it is rare that someone does not have a supernatural power or ability (80% of the world has a quirk). 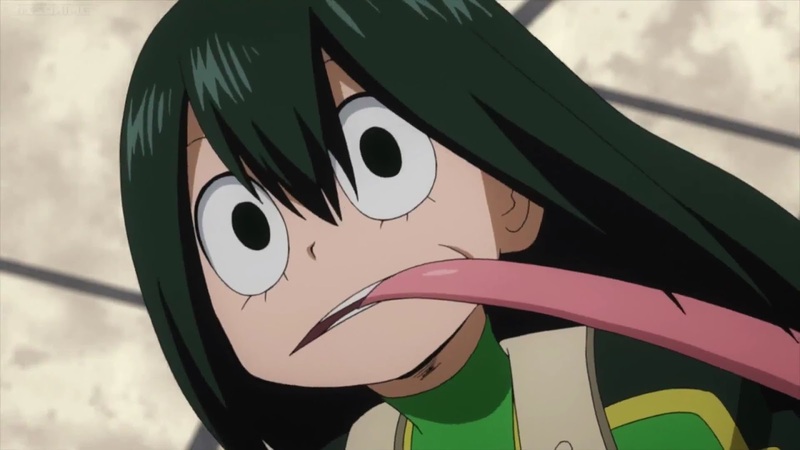 These quirks come in many different shapes and forms, such as the ability to cause massive explosions to just having the characteristics of a frog. Quirks can seem powerful or weak, but they are all only as useful as the situation that demands them, meaning that some are simply better than others within certain situations. Ultimately, just how strong a quirk is can rely on the user’s ability to wield it. Within this world of super-powered people, becoming a “professional hero” is now a reality. Fame, fortune, and adoration all awaits those who are able to become successful at defeating threats and saving the lives of others (which reminds me heavily of One Punch Man). This is something that many dream of doing, yet most of them simply lack the ability to become a professional hero because of traits they are lacking. The biggest things that come down to whether-or-not you have what it takes is your attitude, your determination, and your quirks power along coupled with your ability to control it. So tell me, what happens when our protagonist, Izuku Michidoriya, longs to be a hero but is born without any quirks? The foundation of this story is solid. Normally within battle-oriented shounen of any kind, the protagonist is someone who is born or gifted with abilities that will set them apart from the rest; such as how Naruto Uzumaki from Naruto had the Nine-tailed Fox “Kurama” within him. This is vastly different in the fact that Michidoriya does not have any powers and is therefore weaker than everyone surrounding him with no possibility of growing stronger, this intrigued me. Despite his will and determination, Michidoriya is obviously at a severe disadvantage from doing what he wants to do and has no real way to overcome this. I found this to be a burst of fresh air from all of the other manga which makes the main character born with an innate ability that will surpass all others after “proper training”, at least I thought. Michidoriya happens to idolize one particular hero named “All Might”, who happens to be the #1 ranked hero in all of the world. As a child, he constantly watched an online video which showed All Might saving thousands of people from a disaster, and revered him as the symbol of justice and peace. 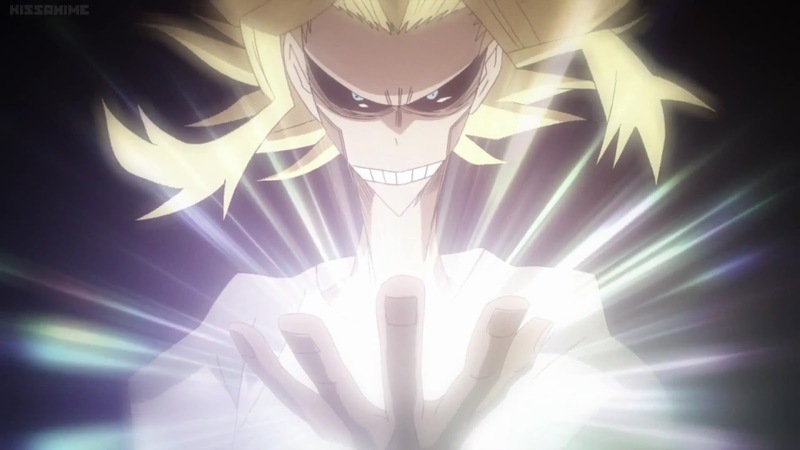 However, after a chance enter, learning All Might’s true nature, and being selected as a worthy successor for his quirk “One for all”; we quickly find out that Boku no Hero Academia is going down the very same route that many others had taken, and I hated it. I absolutely abhorred how it seemed like this particular series was going to be based off of the guts of Michidoriya to make up where others excelled at, while also discovering a way to even the odds of the handicap he was born with. This is quickly thrown out of the window by him “inheriting” the powers of the #1 hero. All Might choosing Michidoriya based on his show of courage despite those around him showing cowardice while having powers, is exactly the same as how Steve Rogers in “Captain America” is deemed worthy enough to undergo the “Super Soldier” project in the Marvel cinematic universe. 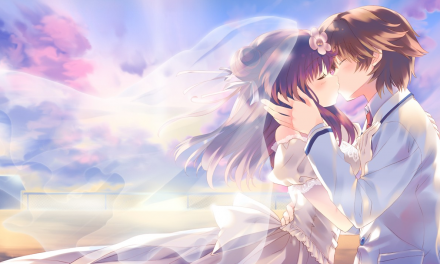 My mood began to change as I continued to watch the anime and saw how things would play out. The determination of Michidoriya within all things did indeed make him worthy, and the fact that he could not completely control his powers kept him from being ridiculously strong in the very beginning. Seeing All Might fight shows what young Michidoriya will be capable of by the series end, or even the ability to actually surpass what we have witnessed. This is both a cause for excitement and determent in the fact that we know what his quirk does but not how he will use it. On the other hand, throughout the entire anime they do a particularly good job of displaying why Michidoriya is a suitable candidate, and more importantly, why he needs to master the power of “One for all” as quickly as possible. They make it a dire fact that the world is going to need Michidoriya very soon, and the fact that he cannot control his powers in the least makes for nervousness on the parts of all parties who know the “truth”. By displaying the villains and establishing the antagonists within this season, we see what “professional heroes” have to deal with and the frightening reality in which Michidoriya will have to face. It is this fact that propels Boku no Hero Academia forward, and it will be the upcoming turning point when Michidoriya will have to step up that will usher in a new age in the series (which one can guess from the final episode of the anime, as one figures out the villains’ motives). All-in-all, Boku no hero Academia does a very good job in showing who Michidoriya is and why the series is going within the direction it is. While the idea may not be original (as it borrows from One Punch Man and Captain America to a certain degree), it has its own flavor and provides an interesting plot. All that is left is for us to see a second season and witness Michidoriya’s growth. Despite the fact that this anime had a terrific plot and a great story thus far, I did not really enjoy many of the character designs. A lot of the character’s costumes when they enter the hero academy “U.A.” look very stereotypical. While I understand that many of them were designed by the students themselves, therefore they are bound to not look as cool as you would think, the fact that the artist did not give them better attire was part of the reason I could not get into any of them. Aesthetics are very important to me, and while I did happen to like a few characters (the main villain of this season as well as the U.A. first year student “Tsuyu Asui”), I did not care for most of them. However, the main character, Michidoriya, is very relatable as I am somewhat of an underdog myself. By starting off the main character as someone who under excels, but is worthy of receiving an “A for effort” really saves this series in more ways than one. A series is extremely unlikely to make it, even with a good plot, if the main character is not likeable. Something else I hated were their powers. Many of the people shown did not have powers that were very cool or very practical. Minoru Mineta had the ability to tear off purple balls from his head that made opponents stick, Mashirao Ojiro has a giant flesh-tail thing, and Yuuga Aoyama can shoot a laser out of his belly button (for no more than a second before his stomach hurts), just to name a few. Do not get me wrong, you have some students with interesting abilities; such as Shouto Todoroki who is half fire and ice (with the ability to control both) or Momo Yaoyorozu who has the ability to create any non-living object, but these are very few and far between. I wish they would have given the characters better abilities or at least showcased them better within this first season. However, seeing as though most normal people that are not heroes have no idea how to use their quirks in combat situations (which is why we have professional heroes), it could be that they are just inexperienced and have no idea how to fully utilize their abilities yet. As far as their personalities, I only cared for a few as well. Many of the characters in my opinion, are simply not likeable for a variety of factors. Cowardice, arrogance, stubbornness, etc. I have never thought that this many characters in a shounen anime that I actually liked were just not “cool’ within some form or fashion. While I do end up liking characters like All Might (where I did not before), many of my feelings remained unchanged from the very beginning of the show. Overall, I just generally disliked most of the characters within this show (except for Izuku Michidoriya, Tsuyu Asui, and the main villain of this season). While I might grow to like them over time, it is beyond a doubt that right now I could not name but so many characters whom I think are awesome, which is a shame since this show’s plot is starting off great and the concept of Michidoriya inheriting “One for all” is an awesome take on an old concept. STRENGTHS – Terrific final fight, very good storytelling in the opening episodes, main character is relatable, and the season ends on a strong note. WEAKNESSSES – Most characters are simply not likeable, follows the shounen “protagonist has a power stronger than anyone’s” cliché despite formulating a justifiable reason why, and horrible designs on most character costumes. Boku no Hero Academia is without a doubt a great anime. While I personally do not believe that it is as good as everyone is making it out to be when you sit down and examine everything within the anime, it is entertaining and enjoyable within its own right. As things begin to heat up and we see Michidoriya grow, odds are that the anime will take on new life and bring about scenes as epic as the battle within episode 12. I would very easily recommend this anime to anyone who is wanting to watch something from the current season, as this anime is a sure-fire hit and will no doubt be one of the up-and-coming anime to last for years to come.